President Carter shares his cancer experience and recognizes the role research has played in making advanced treatments possible for patients like him. 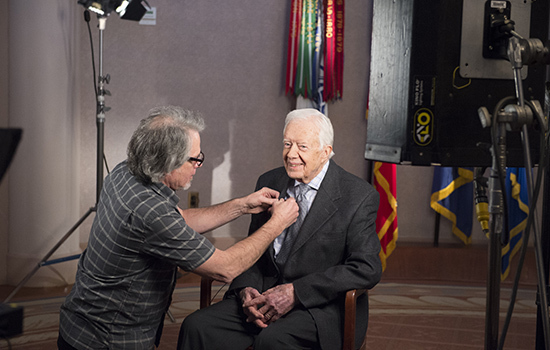 President Carter recorded a video message about the progress of cancer research. The treatments that former President Jimmy Carter refers to included minimally invasive surgery, stereotactic radiation, and a brand new immunotherapy drug. It's been barely a year since Winship doctors removed a tumor on the President's liver and found four additional tumors on his brain. As cancer survivors know, a lot can happen in a year. Molecular testing done on the liver tumor led to a diagnosis of metastatic melanoma. President Carter shared that information with the world via a packed press conference at The Carter Center on August 20, 2015. He also told the assembled media that his doctors had recommended an advanced radiation treatment that would target the brain tumors, and an immunotherapy drug recently approved for treating metastatic melanoma. After revealing his cancer diagnosis and treatment plan, President Carter shared his progress by giving regular updates to his Sunday school class in his hometown of Plains, Georgia. In December, he told his church class that a recent brain scan showed no sign of cancer. In early March, he told them he no longer needed immunotherapy treatments. The open and candid way in which President Carter has shared his experience has brought public attention and awareness to the progress being made in cancer treatment. Winship scientists and doctors are proud to be doing the research leading to better treatments and grateful that President Carter has acknowledged their role in this decades-long effort. 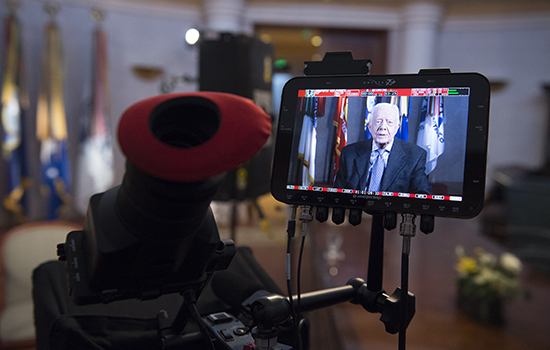 In recognition of scientific progress and the role Winship has played in advancing cancer research and treatment, President Carter videotaped a message that was played at the Winship Gala held on April 30th. A close look at how new drugs work with a patient's own immune system to fight cancer. You can find Winship people at work all over the globe. Better screening and minimally invasive surgery are changing the prognosis for patients with early-stage lung cancer. Atlanta native and a star safety with the Kansas City Chiefs, Eric Berry came to Winship to be treated for lymphoma. Grateful patients contribute to research and inspire hope for the future. Winship's premiere fundraising events, Fashion A Cure and the Winship Gala. New ways to help patients better understand the world of cancer treatment. If the ship is going down, Judith Haase is the kind of person you want in your lifeboat. The National Cancer Institute requires designated cancer centers to have a formal membership application for its faculty. Membership is open to any faculty member of Emory University with a predominant interest in cancer or a cancer-related discipline.